Looking for a great gift idea? The Friends of the UC Santa Cruz Farm & Garden will unveil their latest cookbook at their Holiday Tea and Sale on Saturday, December 4, from 11 a.m. to 4 p.m. The event will take place on the patio of the new River Café and Cheese Shop at the Farmer's Exchange complex, 415 River Street in Santa Cruz. 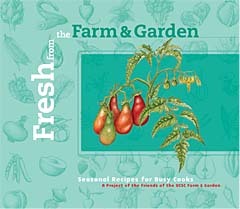 Just in time for the holidays, the Friends of the UCSC Farm & Garden have a new cookbook featuring fresh seasonal produce. The Friends' third cookbook project, Fresh from the Farm & Garden: Seasonal Recipes for Busy Cooks, brings together recipes that feature fresh, seasonal produce from farmers' markets, Community Supported Agriculture (CSA) projects, backyard gardens, and other favorite sources. The 120-page volume also features cooking tips, food history, and other interesting information, as well as beautiful illustrations by artist Dov Bock. The new cookbook will be available for a feature price of $15 at the Holiday Tea and Sale. Following the sale it will also be available at local independent bookstores, or can be ordered from the Friends of the Farm & Garden by contacting Joan Tannheimer, (831) 459-3240, 459-2799 (fax), or by e-mail, jonitann@ucsc.edu. Note that a $2.50 shipping and handling charge will be added to mail orders. In case of rain, the sale will move to the adjacent Patagonia store.